Is chief executive candidate Regina Ip Lau Suk-yee trying to get sympathy votes or trying to show she's become a different person since 2003? She is now saying that Beijing's "insecure" leaders have been trying to offer her top appointments to national bodies in exchange for dropping out of the leadership race next month. Ip has also criticized front runner Carrie Lam Cheng Yuet-ngor as "Regina Ip" from a decade ago, who thought everything she did was right. "[Lam] was like what I was some 10 years ago," Ip said in an interview with Cable TV, referring to her intense unpopularity when she tried to push through Article 23 and failed spectacularly, and had no choice but to resign. 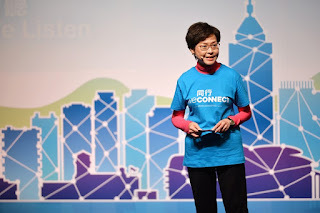 Continuing her critique of Lam, Ip said: "[She] always fights those who hold different opinions as she has spent too long in the administration and hears only one side of voices -- just like how I was before." So far Ip has only secured about 20 votes from the Election Committee and needs a minimum of 150 by next Wednesday to be on the ballot. Lam already has 300 nominations. Ip also said it was rare for Beijing to express its strong preference for a candidate before the nomination stage. "The central government is... insecure," Ip said, suggesting Beijing was worried she would take votes away from Lam. "I think it would bring no good to the governance of the next administration if it is perceived that a candidate could only win the race because of the strong backing from the central government." She also revealed that someone claiming to have close ties with Beijing had offered to compensate her if she quit the race. 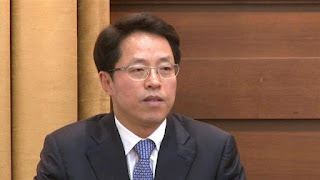 "They said I do not necessarily need to stay in Hong Kong if I want to serve the city as they could offer me posts at the National People's Congress or the Chinese People's Consultative Conference... even very top positions. But I do not want a consolation prize," Ip said. In December, Ip said Zhang Xiaoming, director of Beijing's liaison office in Hong Kong, had once asked her to be the Legislative Council president. She dismissed it as a signal from Beijing that she was not a favoured candidate, Ip said at the time. Is Ip serious? Or is she just talking a load of hot air? It's really intriguing that she is so open about what Beijing is trying to do behind the scenes. It seems Beijing is anxious about Ip losing big time and like an overprotective parent wants to cushion the blow by offering what she calls "a consolation prize" now. If you had 20 nominations, would you take up Beijing's offer? Even Woo Kwok-hing has 70 nominations -- not bad for a black horse. Ip may have to face the music and realize that even though she may have tried to change her image, people still have very strong reactions to her and distinctly remember what she did in 2003. She may have been following orders, but she pushed through what was very contentious legislation.